On the 28th (Thu), see some colorful creatures with a scuba or snorkeling tour, identify plant and animal life at Florida Keys Wild Bird Rehabilitation Center, then take in the exciting artwork at Old Road Gallery, and finally look for gifts at Bella Sol Fragrance Bar and Gifts. On your second day here, glide through the air with a parasailing or paragliding tour, see what you can catch with a fishing tour, then take in the exciting artwork at Michelle Nicole Lowe Art Gallery, and finally take in the exciting artwork at Gallery Morada. To find where to stay, ratings, reviews, and more tourist information, you can read our Islamorada online day trip planner . Prague, Czech Republic to Islamorada is an approximately 16-hour combination of flight and shuttle. You can also do a combination of bus, flight, and shuttle; or do a combination of train, flight, and shuttle. The time zone difference when traveling from Prague to Islamorada is minus 6 hours. Prepare for much hotter weather when traveling from Prague in February: high temperatures in Islamorada hover around 30°C and lows are around 23°C. Cap off your sightseeing on the 1st (Fri) early enough to go by car to Marathon. Start off your visit on the 2nd (Sat): look for all kinds of wild species at Crane Point Museum & Nature Center, look for all kinds of wild species at National Key Deer Refuge, and then kick back and relax at Bahia Honda State Park. On the 3rd (Sun), you'll have a packed day of sightseeing: look for all kinds of wild species at Marathon Garden Club, kick back and relax at Sombrero Beach, and then look for all kinds of wild species at Pigeon Key Foundation. To find more things to do, ratings, photos, and more tourist information, refer to the Marathon trip site . Traveling by car from Islamorada to Marathon takes an hour. Alternatively, you can take a bus. In March, daily temperatures in Marathon can reach 32°C, while at night they dip to 24°C. Cap off your sightseeing on the 3rd (Sun) early enough to catcht the bus to Key West. 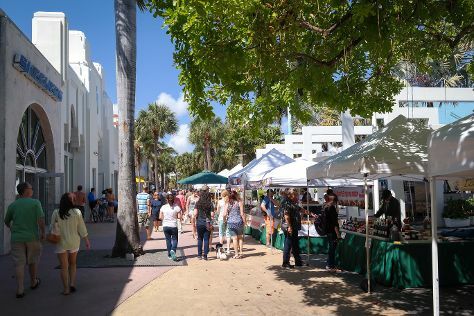 Kick off your visit on the 4th (Mon): take a stroll through Collins Avenue, take a stroll through Lincoln Road, then admire the striking features of Art Deco Historic District, and finally enjoy the sand and surf at South Beach. On the next day, buy something for everyone on your list at Bayside Marketplace, shop like a local with Aventura Mall, and then enjoy the sand and surf at Fort Lauderdale Beach. To see ratings, where to stay, reviews, and more tourist information, read Miami Beach trip maker . Getting from Marathon to Miami Beach by car takes about 3 hours. Other options: take a bus; or do a combination of bus and flight. In March, daily temperatures in Miami Beach can reach 32°C, while at night they dip to 21°C. Finish your sightseeing early on the 5th (Tue) to allow enough time to drive to Orlando. Kick off your visit on the 6th (Wed): discover the magic at Walt Disney World Resort. On the 7th (Thu), you'll have a packed day of sightseeing: laugh and play at Discovery Cove. To find where to stay, maps, photos, and other tourist information, you can read our Orlando trip builder app . Getting from Miami Beach to Orlando by car takes about 4 hours. Other options: take a bus; or take a train. Expect a bit cooler evenings in Orlando when traveling from Miami Beach in March, with lows around 17°C. Finish up your sightseeing early on the 7th (Thu) so you can travel back home.